An ultra-light, non oily fluid ideal for skin feeling tight after shaving. After shaving apply to skin to sooth razor burns and eliminate the feeling of discomfort, even helping heal small cuts. The Soothing Aftershave Lotion slows down hair-re-growth and rebalances the skin by reducing excess sebum. Skin is left feeling hydrated, supple and more resistant to harsh external factors. Suitable for all skin types, even the most sensitive. Boswellia Serrata Extract, Liquorice Derivative, Essentail Oil of Clove, Essential Oil of Eucalyptus, Fibraurea Recisa Extract, Jojoba and Coconut Oil, Imperata Cylindrica Extract, Aloe Vera Pulp, Moringa Oleifera Protein Extract. Great aftershave lotion . Absorbs quickly and non-greasy. Woody, manly smell and if there are any nicks after shaving it deals well with them too . 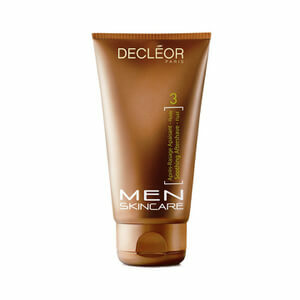 I would recommend to look at the giftpacks first - mostly there are on Mankind Decleor giftpacks , including this item . Just for a little bit more you can have this AND a couple of the other great Deceor man products too! If you havent yet tried Decleor for men , then i would certainly recommend trying them - quality products at a great price - and with the added bonus of a free gift courtesy of Mankind !